Lousy day out today so I am running 3-100 rnd batches of ammo in DAG Berdan brass. Setting primers with hand primer is always fun. First hundred rnd batch was with Varget. Forgot to photo that one. Starting next batch with 4064 and then I will finish up with one using 4895 all using cusome 136 gr FB .308 bullets. I'm not taking a picture of my reloading area, which is the kitchen floor and a Lee hand press. I need to pick all that stuff up so I can mop. Aint you old enough to know what works by now? Always getting ready, but never ready. Was it raining on June 11? If you are taking pictures of the grandkids with the same camera, ya might want to set your date. Today is 06/11/2018 Six November 2018. Get with it dude. 45g of all three powders? Izzat military date? We normally program ours mm/dd/yy. No problemo. Having had a Dad, myself, two sons and now a grandson in the military, it's just easier to keep it all the same. Too darn old to change now. That "grungy" old Rockchucker looks familiar. I had my handle threaded for the newer style round ball, like it much better, especially on long sessions. Looking at doing the same on my Pacific. I'm swaging primer pockets on LC 5.56 brass. Decided to move it to a more comfortable location. Built a portable press stand from scrap, glued with Titebond 3 and Kreg jigged it. One coat of tung oil after light sanding. Got a ziplock bagful done last night. No progressive press? For shame. No progressiveness in my politics either. I like having more time for shooting rather than eating that time up loading, but to each their own. It goes both ways. Sometimes I wonder how uniform my powder dumps are when I get a stinker that shoots 4 inches low. I get +/-0.1 gr. on my RL550. Did a trial run with twenty charge weights. I mainly load IMR 4895 and Ramshot Tac. Same consistency with both. Trust your equipment, set it up correctly, and operate it consistently. I know any abnormal results are me and not the rifle or ammo. I will never stop developing loads till stop buying and building new rifles, especially precision/custom turn bolts. Then we always have new projectiles and powders to test but have to admit have been buying more and more Tubbs DTAC in 5.56 and 7.62 as my standard "test ammo" to use across a variety of rifles to compare accuracy on a level playing field. His 5.56 69 grain SMK's are some of the most consistent rounds I have used across a wide range of my 5.56 poodle shooters. Their 6XC offering am still having trouble building a load that outperforms it by enough of a factor to warrant the effort though I keep trying and its about as cheap to buy their loaded ammo as load real precision handloads at times. I do all my precision loading on single stage presses in lots and generally set up two or three presses. One for neck size/shoulder bump, another for bullet seating and a third press if doing a crimp so once set up and run my ladders then decide on final charge don't have to worry about any error in resetting dies even to a thousandth or few. Leave the presses set up till have my load tweaked including any seating depth, crimp pressure, shoulder bump adjustment stays locked in same position then run however many rounds think I may need. As to progressives I cant stand swapping calibers and having chance at losing uniformity. 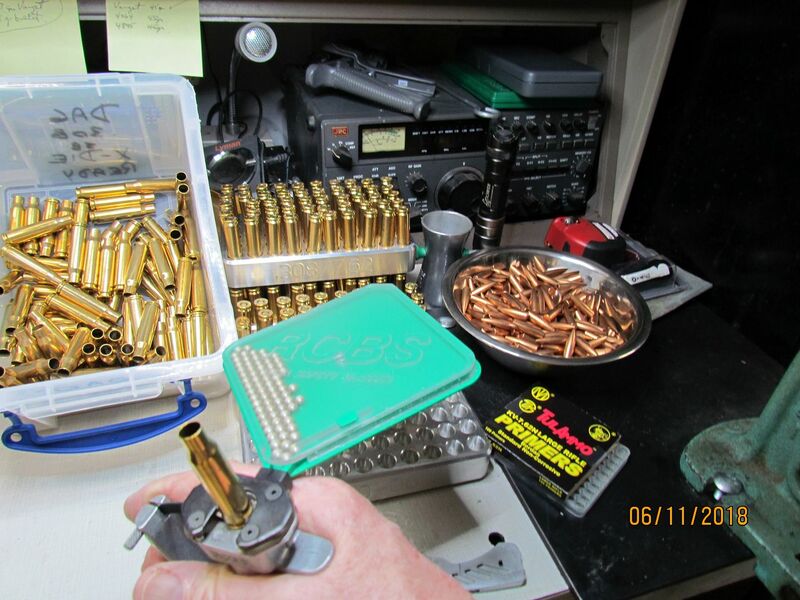 Except for installing a new set of dies about twenty years ago my 45 acp progressive has not seen a die adjustment, powder drop tweak, etc in 30 years. When I purchased my first 40 Smith and then bought a second and third purchased a Dillion Square Deal B in 40, set it up and developed a load which has not been tweaked since. Same with my 5.56 and other caliber setup Dillons. On occasion a die needs replaced or press needs and upgrade but otherwise they run years with zero changes so know getting same ammo a decade from know as a decade ago. Have power trimmers in at least fourteen cartridges that never get changed and RCBS three way trimmers in all 224, 257, 308, 277, 338,6.5mm, 7mm and add them as RCBS does so my trim length, champher and deburr never changes. Have 224 three way trimmers in 22 hornet, 5.56, 22 Nosler and other 22 caliber set up trimmers. Same with 30 caliber have trimmers withe three way cutters set up in 308, 300 Win Mag, etc and once they are set up unless wear a cutter completely out never rest that trimmer. Something about knowing my case length, die settings and powder measure settings never change and do not have to tweak obsessively if use the same device for multiple cartridges just seems to make sense, save time and ensure consistency. I like to see folks constantly trying to improve their loads. Met a man during Sandy Hoook shortages due to me beating him to all the local powder he needed in his early 80's then who shoots 22 Hornet almost exclusively now. We have become friends and he has taught me more about the Hornet than had ever known. Watching him run ten rounds into a single hole at 100 and shooting 1/2 MOA and under at 200 yards with his Hornets has been an experience that has really upped my game with tiny rounds. Watched rifles was sure were sure had best load developed for them suddenly shrink 1/4 MOA and more under his advice and tricks. I will never stop trying to come up with more accurate rifle/ammo combinations. What do you do if hear a country calling DX or interesting station call while have radios blocked with loading stuff? I have to keep my radio bench separate from reloading benches. That's simple, loading is way more important these days. I have become a SWL while at my bench. When I do operate it is mostly CW. Gave up contesting and collecting QSLs about 20 years ago. Now a relaxing QSO fills the needs. Used to mess with Packet, RTTY, SSTV, and some FSTV on 450 band. I do miss the 75 AM rag chews at times. Keep the old Collins at the ready in case the urge returns. SIG Sauer brass, CCI BR2 primer, H4895, Hornady 178gr. ELD-M.
Loaded on a Lyman T-Mag II. Load is near the maximum, should get me a tad over 2700fps with a 26” barrel. If don't drop a round vinyl disk on the turn table and run the vibrations from needle through two big glowing tubes into a pair of Bose 901's while loading keep the P25 public service radios on along with a couple dual banders monitoring local repeaters along with the PSK31 waterfall running on 30 meters. I gave up on contesting and collecting QSL cards or filling a logbook with new stations years ago. On occasion hear a unique station that warrants warming up the amp and busting a pile up but trying to get someone to return a call, swap signal reports and sign off is just boring. Give me an interesting station across the pond, Australia, Africa or South America or even in Alabama I can sit and actually have a conversation with is much more rewarding. Nothing I hate more than having a friendly chat with someone who is of same mindset and both keep getting interrupted by folks who realize they have an opportunity to pick up another line in their logbook to point we both sign rather than fight the incoming pileups on both ends. Have a big station at work, nice station in reloading room and a third all band/all mode station in the panic room. Because of which my bench with most progressive presses is in panic room and bench with most radios is in reloading room. 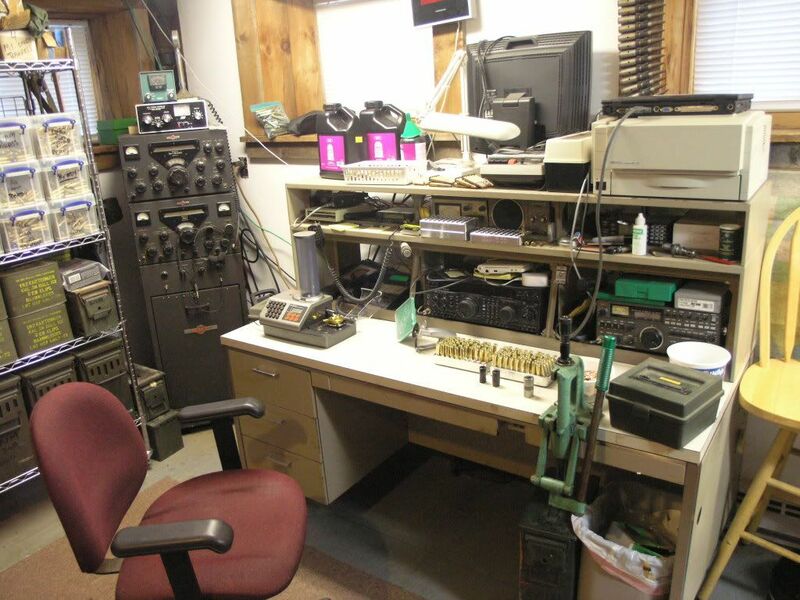 Would make more sense to put all radios in the panic room and all presses in the reloading room but sure is nice to hear a local friend on repeater, see the 30 meter PSK waterfall running like graphics in the Matrix movies or a nice sounding 75 meter station calling, the ability to roll chair around and belly up to the row of radios without moving anything around is nice but luckily have gotten away with being greedy and having control of majority of square footage in basement. Right now have a pile of new projectiles from LeHigh, Cutting Edge, Barnes and Nosler that are all relatively new to market and need to see what their capabilities are. Like to run a few ladders, find a powder and charge that groups well while keeping velocity above 90% to 95% of book maximum if not more then test their performance in gellitan, clay, through barriers and with armor. I have a lot of loads that I know work along with my "go-to" powders and primers for specific applications but when add a new cartridge like 22 Nosler, 6.8 spc II , 458 SOCOM plus wildcats have to rework each for pet loads. Found a decent deal on a batch of 197 grain 7mm SMK's and need to see what a 7mm projectile with 0.780 B.C. is capable of in my long action turn bolts such as 7mm Practical and 0.765 B.C. at 7mm-08 velocities. For me sticking with my old tried and true pet loads will always be something I do but also cannot resist ocassionally testing new bullet technologies, new powders and looking for an extra tenth MOA of consistency, especially on my long distance precision loads for custom turn bolts. Too much new bullet technology coming down the chain of supply to ignore and not experiment with. Hornady knocked it out of the park with those ELD-M's. My brother shoots those through his .308 and I shoot the 147 gr. 6.5's through my AR. I'm still reserving judgement on the new Hornady ELD's. I shot a lot of the 75 and 80 grain Amax's, and they always performed well for me. But a super accurate AR with 1 in 7 twist was all over the place at 300 yards with the 75 grain ELD. It shot 69 Lapua's very well. Personally am liking the new Nosler RDF (reduced drag fqctor) projectiles a lot. Playing with the 175 and 185 grain 7mm projectiles currently along with 175 and 210 grains in 308. Using the 210 grain bullets in my 300 Win Mag and trying the 175 grain 308's in a couple of my turn bolts. With the 7mm am trying to discern if the ten grains makes a difference especially how much farther the lower weight allows them to stay supersonic in my big 7mm's. For those wanting to squeeze the most performance from their competition rifle, Nosler’s RDF (Reduced Drag Factor) match bullet line is the ideal choice. *Nosler’s RDF line was designed from the ground up to provide exceptionally high BCs, which create the flattest trajectory and least wind drift possible. The keys to the RDF’s outstanding performance are Nosler’s meticulously optimized compound ogive and long, drag reducing boattail, which make handloading a snap and create an incredibly sleek form factor. *RDF bullets also have the smallest, most consistent meplats of any hollow point match bullet line, so there is no need to point or trim tips. For a guy who points almost every match bullet he loads and trims if don't like how consistent they tips look out of the box. Have tried shooting the RDF after pointing side by side with projectiles straight from the box not pointed and when put on runout gauge can find no difference on measurements and accuracy is identical with all other factors being equal. Thus my need to always be experimenting as occasionally find a new projectile that becomes magic in one of my trusty custom turn bolts. Will buy a 50 count box of most promising new projectiles as hit the market, run two ladder tests using two powders that normally shoot well with particular rifle and weight range of bullet. Leaves me enough to dial in a load and if it shows a chance of real improvement over rifles curent gold standard pet load then buy another box and chase them as far as I can to see if it's time to replace an old friends favorite fodder. Also like to test specialty projectiles like Lehigh Controlled Fracturing, Controlled Chaos, Xtreme Penetrators, Xtreme Cavitator, Close Quarters, Flash Tip and more. Till I see what a sample will do in test media will always wonder if missing out on a better mousetrap and why I have the RIP ammo so many people seem to think is the bee's knees for a while, especially hillbillies like my brother. Had a friend give me two boxes of 380, four of 9mm and two of 45 acp and said was better to be gone than risk accidently loading a magazine with some life may depend on. He said has two 380 and three 9mm failures to feed when one of the sharp petals caught on feed ramp or chamber lip and peeled back like a banana skin and totally bind the gun in a two people using three hands to get the mess discombobulated and gun running. I only had one such failure to feed but discovered when put a rib bone in clay or gellitan block they self destruct on impact and the 40 grain copper base doesn't have enough mass to break the rib and continue penetrating. Brother had to shot a feral cat three times with his 380 RIP before it stopped being aggressive and still doesn't get it assumes the cat didn't have enough mass for bullet to properly open. I don't care how trick a bullet is if a 380 version of it won't kill a house cat quickly not using it for personal defense. If won't break a rib bone don't care how trick it is in ballistic gellitan videos. No matter how trick handgun bullets get its still hard to beat a big hard cast gas check Keith Bullet or SWC. Personally using Hornady Critical Defense and Critical Duty fo defensiver handgun projectiles. Have four standard 6.8 spc II loadings keep in bulk, four 5.56 loadings keep stocked in bulk and six 308 loadings keep in major bulk and four more in what most would consider bulk quantities. Have boxes of ammo so specifically developed the make, model and serial number of rifle their assembled for well marked as were carefully crafted for just the one rifle and some are even range defined as for use with rifle "x" at ranges beyond 400 yards because are too much work and expense to assemble to waste on targets closer than a specific range. 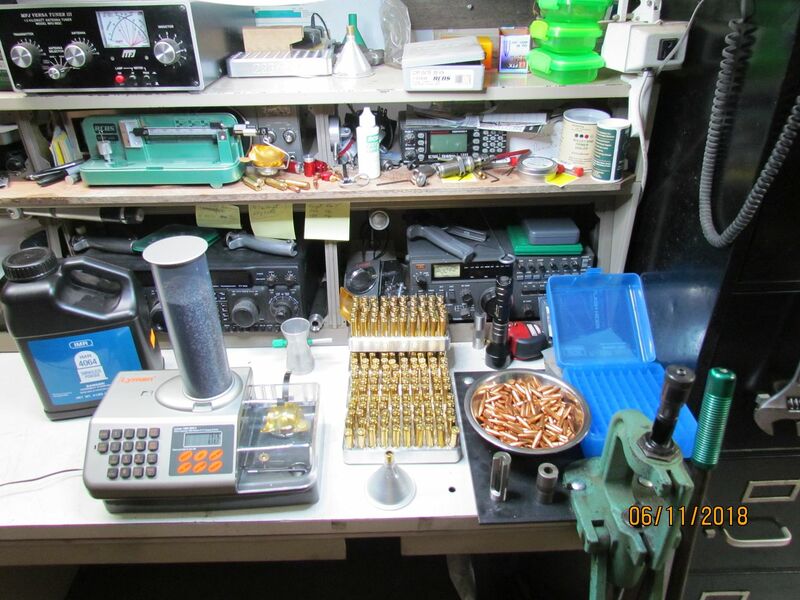 Yes, know I am very odd and spending huge time and money building a load that shoots 1/4 MOA tighter past 500 yards than my standard premium bullets, usually because of carefully matched cases, hand weighed projectiles, etc but otherwise same components as the everyday ammo for that rifle just found a small percentage of cases and bullets in a 500 count lot that all fell in a very close tolerance level so separated into a 100 round box of "better" bullets than the other 400 loaded at same session are nice to have on varmint field or punching paper when with friends. Always want to be improving my rifle building, handloading skills along with finding better equipment to combine with techniques.